5/8" x 1-7/8". With screws. Schlage Cabinet Hinge, Decorative, Series: C907, 6 Holes, 1-5/16 in Door Leaf Length, 2-1/4 in Door Leaf Width, Steel, Yellow, Bright Brass, Used in Fine Woodworking Projects Designed for small chests, jewelry boxes, craft projects, etc. Decorative design. Surface mount for easy installation. Fasteners included. Visual-pack. Polybagged. 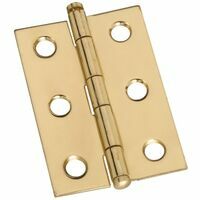 National Hardware Ball Tip Hinge, Series: V1816, 4 Holes, 0.16 in Hole Diameter, 0.04 in Leaf Thickness, 1-1/2 in Door Leaf Length, 0.1 in Dia Pin, Surface Mounting, 5 lb Load Capacity, 7/8 in Overall Length, 2 in Overall Width, Solid Brass, Antique Brass, Includes: Solid Brass Screws, For Small Chests, Jewelry Boxes and Craft Projects Designed for small chests, jewelry boxes, craft projects, etc. Surface mount for easy installation. Screws included. Clear lacquer protective coating. Visual-pack.